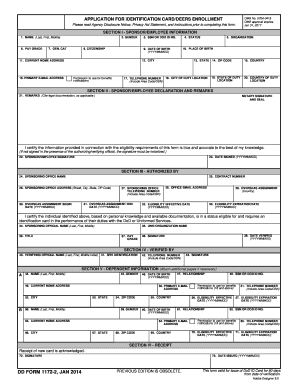 Fillable Dd 137 3 is not the form you're looking for?Search for another form here. Who needs a DD Form 137-3? A DD 137-3 is a form developed by the US Department of Defense, which is officially known as a Dependency Statement - Parent. Logically, it should be used by military members who want to make their parent a dependent. What is Form DD 137-3 for? 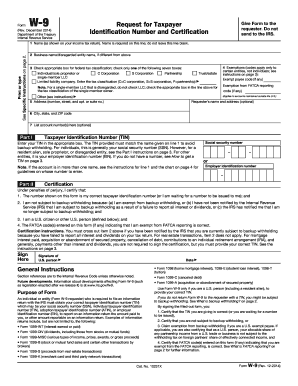 The DD 137-3 Form, or adult function report, should be filled out to claim the parent’s dependency, and provide all the information required by the Department of Defense to determine the relationship between the claimant (sponsor) and the parent and verify the member's eligibility for authorized benefits. 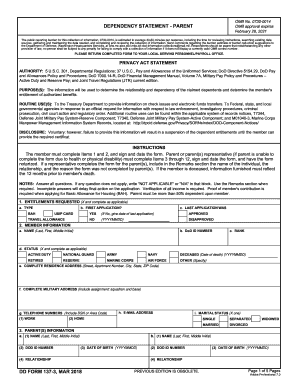 Is DD 137-3 Form accompanied by other forms? and finally, if the claimant is retired, statement confirmation this fact should be provided too. When is DD 137-3 Dependency Statement Form due? The fillable DD 137-3 Form does not have a strict due date; it needs to be submitted when deemed necessary by the sponsor and/or dependent. How do I fill out the 137-3 Form? Following the instructions, part 1 and 2 must be filled out by the sponsor, they are also required to sign and date the form. The other parts of the fillable 137-3 DD Form must be completed, signed and dated by the parent. Finally, the form must be notarized. Where do I send filled out Form DD 137-3? The properly completed form should be directed to the local serving payroll or personnel department office. Fillable WORD document - PHS Commissioned Officer's Request for Dependency Determination (Spouse and/or Child). 08/2005. DD 137-3 (502kb). A. TYPED NAME d. SIGNATURE DA FORM 5748-R MAR 89 b. GRADE c. TITLE e. DATE USAPPC V1. 00 15. LOAD DIAGRAM Sketch cargo storage in space below 16. U.S.
ORDER FOR SUPPLIES OR SERVICES 1 0 PAGE 2. CONTRACT NO. (If any) PAGES 10 1 IMPORTANT: Mark all packages and papers with contract and/or order numbers.